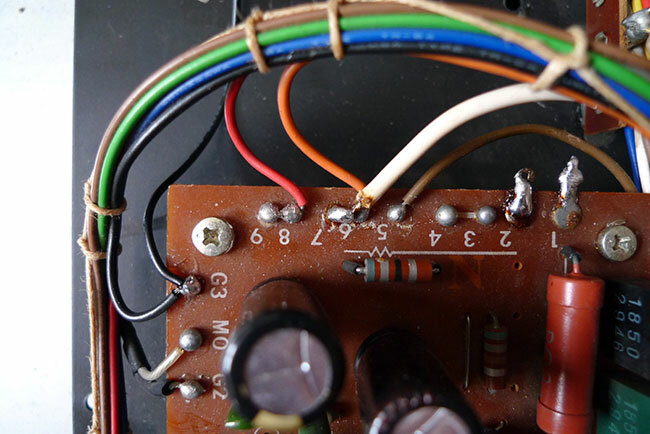 By any modern standards the power supply design on the Roland TR77 is utterly useless. 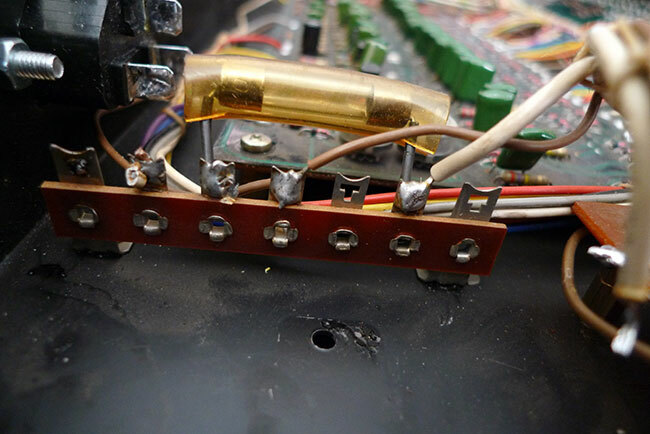 Back in the early 70's they didn't have such magical devices as voltage regulators, so the 24v power rail in the TR77 is essentially AC straight from the transformer, with a couple of filter capacitors to smooth out the worst of the wobble. As mentioned on our main FR8L / TR77 page, the original caps are rated at 25v on a supposedly 24v power rail, which would be an incredibly bad design even using modern caps. After being punished like this for 40 years it amazing these ancient filter caps haven't just gone short and taken the drum machine and your speaker cones with them. The least you should do is replace these caps with something bigger and better, but no matter how big these filter caps are you will still have the problem of excessive AC ripple on the power rails. Combine this with the use of multiple inductors on the voice board and you have a recipe for hum and noise. On the image below the main filter caps are the two big ones on the left. On this unit they have been replaced already. At some point this unit has also been converted for use with a IEC mains socket on the right. 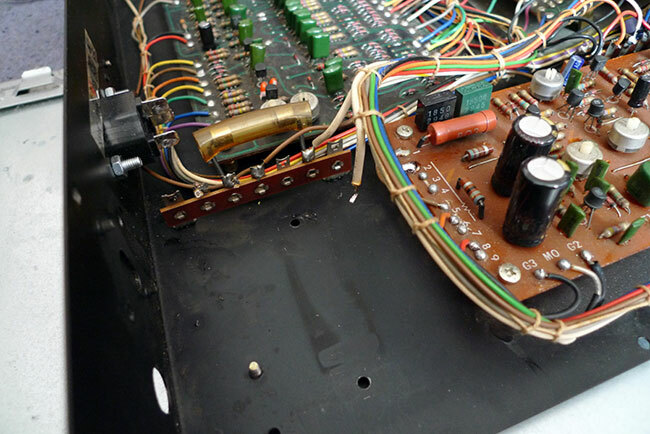 Another issue with the TR77 power circuit is that if you install a midi interface internally and run it from the 24v power rail, it can nearly double the current draw depending on which interface you use. Because the standard power supply has no regulation and is so underpowered, this results in the voltage output sagging under load and you end up losing 2-3v from the 24v rail. The machine will still work on the lower voltage, but you end up with a lower volume and an even worse signal to noise ratio. 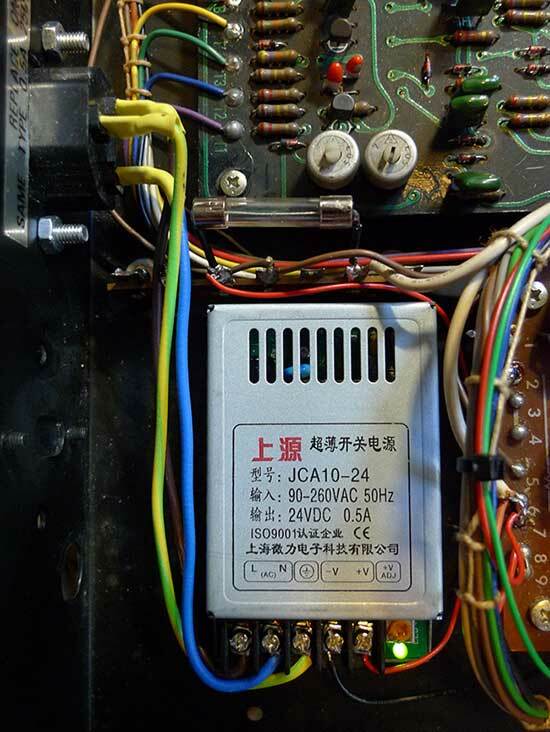 A better idea is to remove the standard TR77 transformer completely, and instead run the machine from a fully regulated external 24v power supply. If you want to see the kind of difference this makes to the noise floor, look at the two recordings below. The waveform on the top is a recording of a TR77 in play mode but with all the pattern buttons popped out, so the VCA is open and you can just hear the background noise. 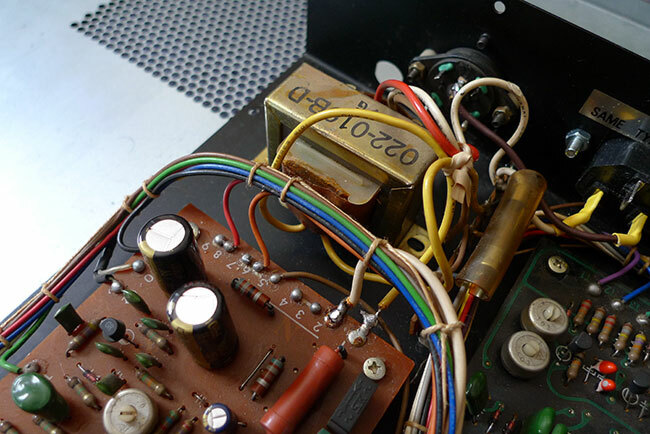 This recording is with the standard power supply as shown above. The pulses you can see are crackle and clicks caused by the tempo LED flashing and creating noise on the power rails. The image on the bottom is the same TR77, but running from an external regulated 24v power supply. 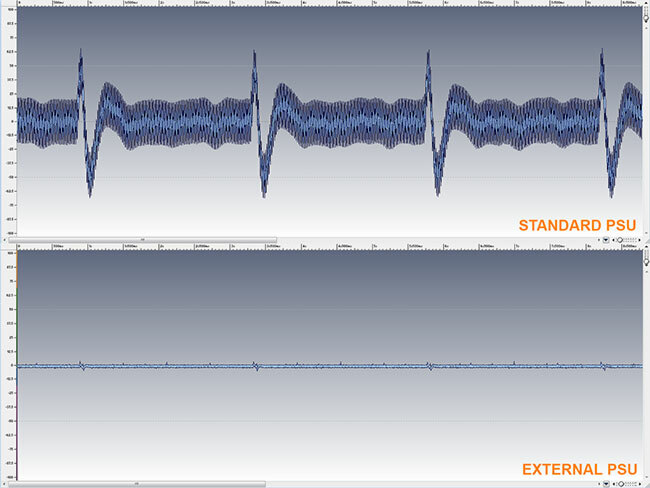 We have zoomed in on both waveforms by the same amount to give a decent comparison. As you can see, there is a massive improvement! 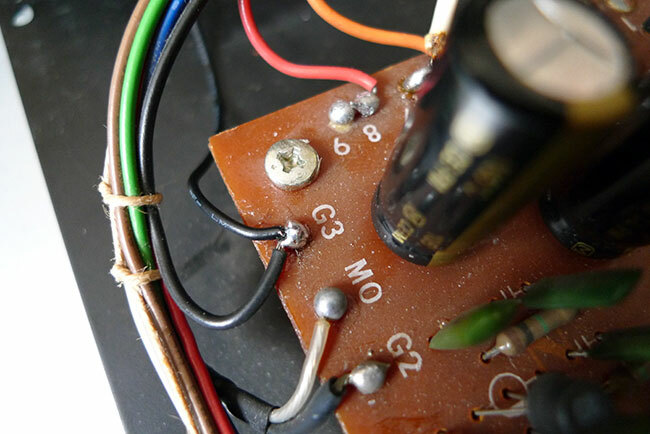 To do this mod you first need to desolder and remove the mains cable and then remove the transformer by unbolting it from the case and cutting any wires holding it in place. You could just desolder them, but its easier to just cut them at the non transformer end. 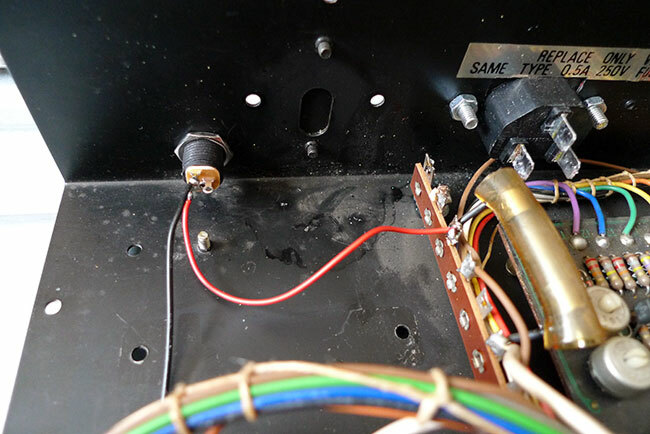 You can also remove the voltage selector on the rear of the case as you won't be needing that anymore. 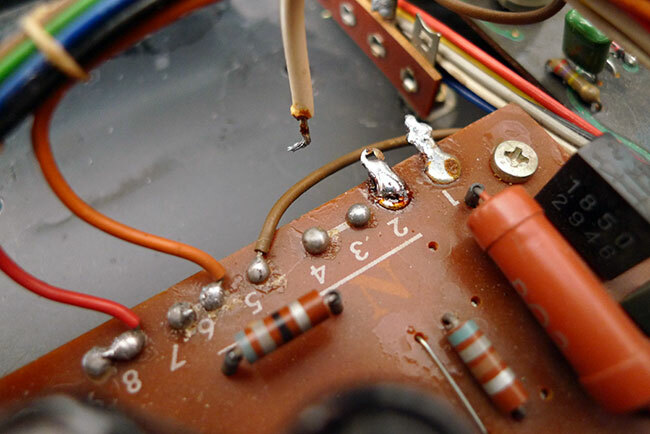 The white wire soldered to the terminal marked number 2 on the rear of the nearby PCB, should also be disconnected, but don't cut it as you will need to solder it back in elsewhere. We'll be reusing this fuse so don't remove it. The white wire that was soldered to terminal 2 should be resoldered to the terminal marked 6/7, where the orange wire is already soldered in. Next you need to mount your new power socket in the casing. We used the handy space left by the removal of the mains cable. 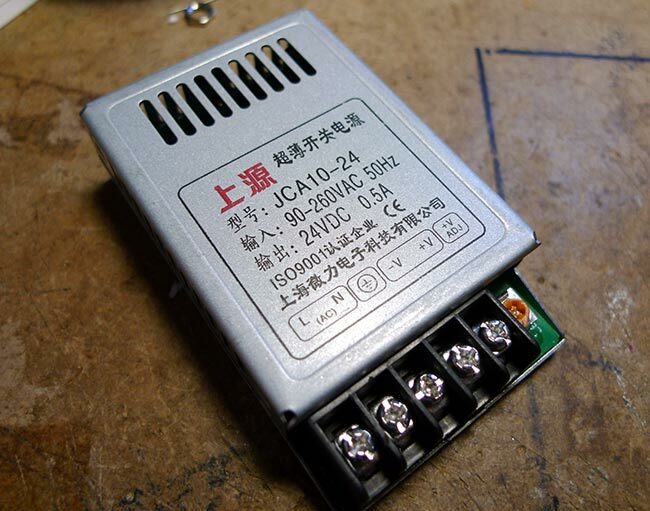 The ground input should be wired to the terminal marked G3 on the PCB, and the positive power input should be wired to the rear most terminal of the fuse, as shown below. Ignore the IEC mains socket thats been installed on the right. Plug in your power supply and check everything is working ok. You'll be needing a 24v supply that can deliver at least 300ma or more. It might be an idea to also install a polarity protection diode if you don't trust yourself to always use the correct power supply, but otherwise you're now ready to enjoy hours of low noise Bossanova action! WARNING: This mod was initially done with an external 24v linear regulated power supply, as opposed to a switched mode one. You may find that some switched mode supplies introduce some fairly severe high frequency noise problems, although this is fairly rare. A fully regulated 24v linear supply would probably be preferable, but they can be difficult to get hold of and are relatively expensive. After a lot of experimentation we have found what appears to be the perfect internal power supply to replace the normal TR77 transformer. They are switched mode supplies, but they don't seem to introduce any more hum or noise than a very well regulated linear lab power supply. They are also more or less exactly the right size to fit in the space left by removing the TR77 transformer, and will run on any mains input from 90-260v. These PSU's are commonly available on ebay or similar for around £5 or so. Just wire the mains to the input terminals of the PSU, and the outputs to the same TR77 ground and positive points that the external power input jack was wired to above. You are going to need a ground wire in your mains cable to use one of these internal supplies properly. In our experience, the TR77 usually doesn't have one, so its probably a good idea to just install an IEC mains socket as shown below.